Bill Gichner passed away on December 8, 2004 at about 10 a.m. He went into a peaceful sleep with Bob Swenson beside him and a few minutes later breathed his last breath. . He lived 91 fruitful years. Services were held on Friday at 1 p.m. at the Addis Isreal Synagogue in Washington, D.C.
For those of you that do not know him Bill was one of the first dealers of used blacksmithing tools and machines in the modern era. He was a finder and a wheeler dealer. He has often been known as Wild Bill Gichner but perhaps better as the notorious Bill Gichner for his high prices. 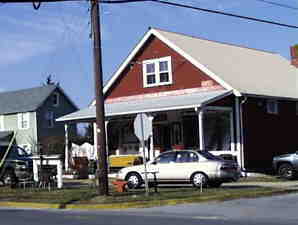 His shop, Iron Age Antiques in Ocean View, Delaware was a meca for smiths all along the East Coast. For a number of years the Bill held a January hammer-in there with the Mid-Atlantic Smiths. In recent years the Bill Gichner hammer-in was held on a farm where there was more space. In the 1970's he traveled in a large van buying and selling anywhere he could. He knew the value of tools and would rarely take less than his asking price. At the 1998 ABANA conference Bill had marked "See Bill Gichner for price" on dozens of antique tools that others were selling! When asked for a price, he charged a fee for for the appraisal! At the 2004 ABANA conference Bill spent the entire evening at the Uri Hofi invitational demo. Dozens of smiths launched their careers with equipment bought from Bill and as such he was one of the resources that helped make the resurgence of blacksmithing in the US possible. On Christmas day operator Neil Winikoff made the announcement that he was closing down KeenJunk.com on December 31, 2004. Although a surprise to his site members he had been telling advertisers for months not to renew their advertising. Reasons given for the shut down were his age and that he felt he had done enough and that he no longer had a helper to maintain the technical aspects of the site. Offers of support to continue the site were promised by the faithful and at least one significant offer to buy, host and maintain the entire site was made. All were refused. Winikoff announced that he reserved all rights to the URL, archives and trademarks and only responded that he would hold on to them "for the future". This site dedicated to sharing information is now lost. In the 11th hour . .
Cyber Smiths International (CSI) has completed incorporation and filing for IRS 501(3)c non-profit status. The long term goal of CSI is to maintain resources like anvilfire.com or KeenJunk.com on-line in perpertuity.